Politics seems the name of the game this season at fashion week. Opening Ceremony brought in female comedians to help stage a story about “immigration, economic inequality, police brutality, and gender discrimination.” At R13, designers leveled a message at the Republican presidential nominee Donald Trump with a “F*ck Trump” print. 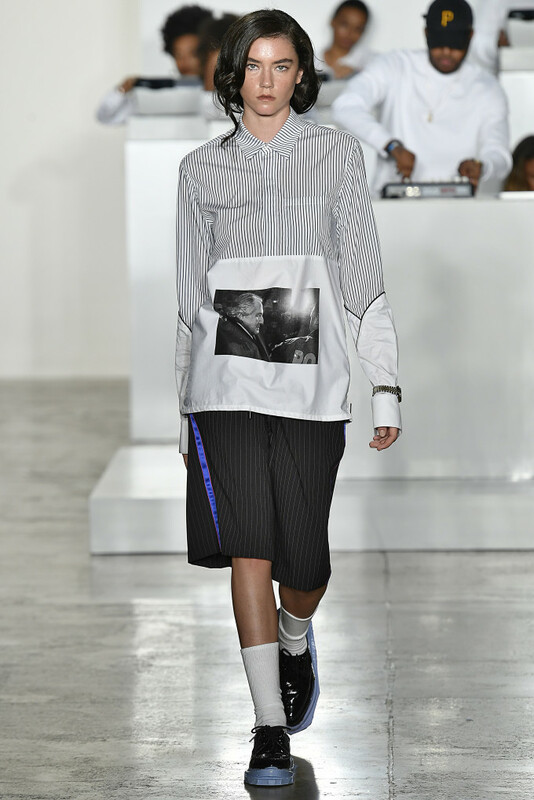 Even Vogue got into the fray, characterizing Kanye West’s Yeezy show as a possible Trump indictment (based on the venue selection, Four Freedoms Park) and kicking off Fashion Week via a fashion show-turned-fundraiser for HIllary Clinton. 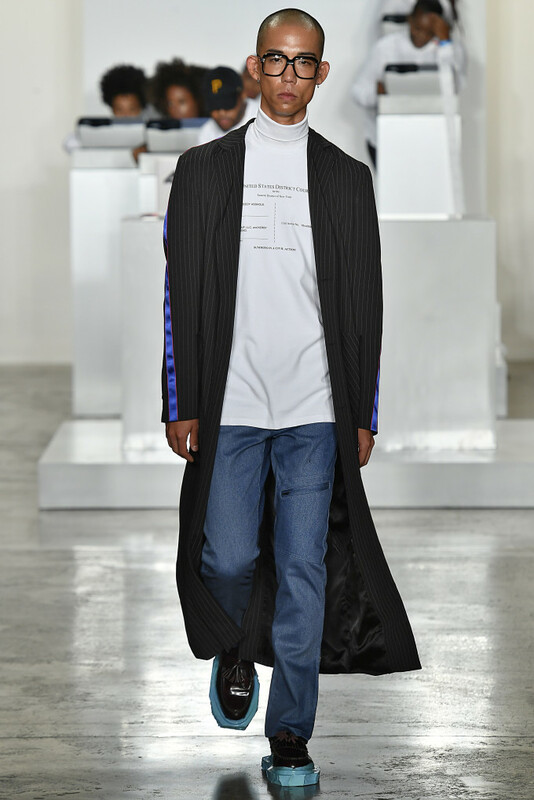 But of all of the New York brands, Pyer Moss is one of the few who can claim it has made its name by creating shows featuring politically-charged messages. A year ago, the brand’s founder Kerby Jean-Raymond showed his first political collection, screening a 10 minute film that focused on the brutalized bodies of black men like Eric Garner and Walter Scott. When the now-shuttered Details.com asked why he decided to play the film before his show, the designer called it necessary. “The film is because I’m 28, I’m black, and I’m living in a time where there’s very much a revolution of thought happening, and if I were to stay silent it would be as stupid as what other people are doing,” he said. “I have a small platform, and I need to use it.” And use it he has. The Spring 2017 Pyer Moss show, held this weekend in New York, opened with Cyrus Aaron—from the original play “Someday”—​spitting rhymes on black economics, the black dollar, gentrification, and the juxtaposition of Bernie Sanders and Bernie Madoff, a tension that inspired the show’s title "Bernie v. Bernie." "You better use some of those bright lights to watch the company you keep,” Aaron said, potentially alluding to some of Raymond’s own struggles this year, including a legal battle with former investors about trademarks and “unfair business practices.” Aaron continued, his words touching on recent incidents like the opening of a Whole Foods on Malcolm X Boulevard—a sign of growing gentrification in Harlem—​as well as the possible conspiracies about Bernie Madoff himself. “He stole $18 billion before being caught,” Aaron rhymed. The five black female cashiers with nametags that read “No Name” and “Anonymous” interrupted the rhyme in unison: “Correction: They let him steal $18 billion.” It was a statement if there ever was one. 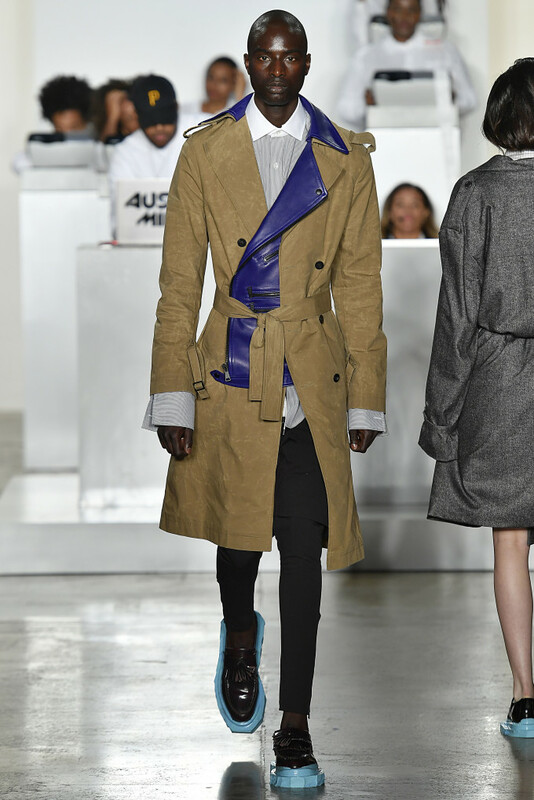 The collection was then presented to an audience that included social activist DeRay McKesson, who was there for his first-ever fashion show, alongside Rich the Kid and Rick Ross. 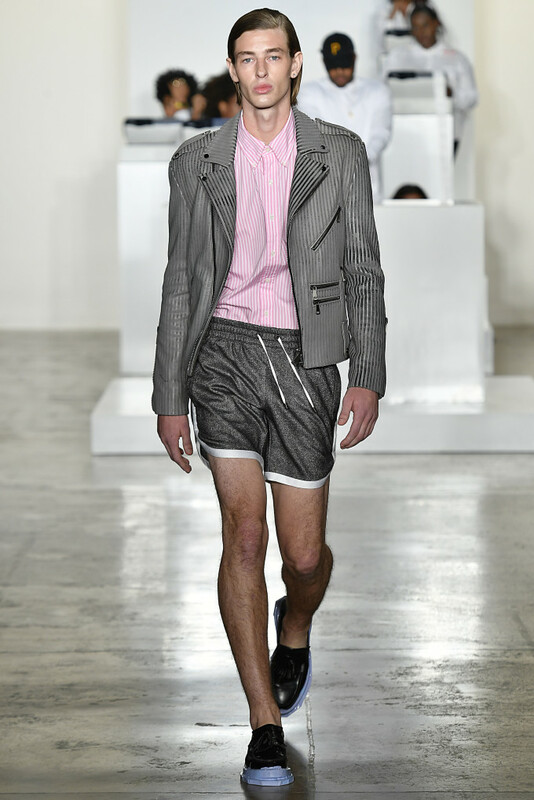 The line-up was a well-edited 24 looks that combined Jean-Raymond’s history of sportswear with more tailoring that the designer has done before. Tops featured phrases like "Come Shake The Money Tree," prints of photos taken at the time of Madoff’s arrest, and even the docket from Jean-Raymond’s own court appearance. Elsewhere, a pair of patchworked pants with a high, cinched waist made an impression, too (although how it fit into the story was unclear). Here, suiting came relaxed, and traditional pinstripe and herringbone fabrics—the type worn by Wall Street types—were flipped on their heads and turned into leather jackets and bombers. The approach to go full-tilt political—and to use his own legal documents as a centerpiece for his collection—is notable because it shows how committed Jean-Raymond is to the cause, even in the face of potential harm to his bottom line. Company representatives assert that Jean-Raymond fully owns his company and trademark, but the litigation, as well as the fallout from last year’s controversial presentation—​which reportedly saw some buyers and sponsors drop their support of Pyer Moss—shows that taking a stand is not without its consequences. Let&apos;s hope Jean-Raymond never has to decide between speaking out and making a living.